The “Amazon Effect”. It’s a term many have heard, but what does it mean? While it can mean different things to different people, in general, it refers to the phenomenon of how consumers’ interactions with Amazon are driving new expectations for how buyers and suppliers interact with businesses, including manufacturers. Terri Hiskey from Epicor explains all. With Amazon, we search for what we need and receive a listing of items with starred rankings alongside customer reviews. Once we decide to buy, we may purchase that product with Amazon One-Click if Amazon has our payment information on file. Once the order is placed, we receive a link to track the product from the moment the order is placed to the moment it’s received. Convenient, personalised, and frictionless. It’s exactly the type of experience customers want. Business-to-business buyers want to search and discover their options, with a multitude of products all in one place before seamlessly placing an order—which is then trackable up until the moment it is received. Manufacturers are now expected to provide such visibility to their end users, as well as a more holistic and simplified buying experience. To this end, manufacturers must think about how they can add and extend value beyond simply delivering a product. This might include providing new services around products such as after-market servicing. Customisation can also give manufacturers a key differentiator and some are even testing out make-to-individual production models. For manufacturers, this means being able to accommodate engineer-to-order, configure-to-order, make-to-order, and assemble-to-order manufacturing modes to meet these specified requirements. Make no doubt about it, the Amazon Effect is driving significant change in how manufacturers operate. However, with great change comes great opportunity. Manufacturers adopting customer-centric strategies are poised to realise significant bottom-line gains. As manufacturers face pressure to deliver an Amazon-like experience, they must also streamline back-end operations via Industry 4.0 approaches, including the Internet of Things (IoT), artificial intelligence and machine learning, robots and automation, and big data and analytics. These approaches support greater flexibility, agility and responsiveness, which contributes to improved customer satisfaction. At the centre of manufacturing digital transformation, IoT streamlines and simplifies manufacturing processes. A drone makes quick work of the previously manually intensive job of inventory counts. Meanwhile, a “Google Maps” universal digital view of the connected factory floor supports improved operational awareness of when machines show signs of performance degradation or maintenance needed, so workers can step in to keep lines running smoothly, avoiding major mechanical breakdowns. Employees wearing smart gloves with 2D barcode technology can track and trace parts with a simple glove scan. Haptic feedback provides user confirmation that the right product has been scanned, providing a new level of process quality and efficiency. Advanced algorithms are also changing the way manufacturing is done. Smart factories with integrated IT systems provide relevant data to both sides of the supply chain more readily, leading to increased production capacity and productivity. Artificial intelligence enables information to be made actionable to drive decisions around adjusting processes or predicting future behaviour based on past trends. 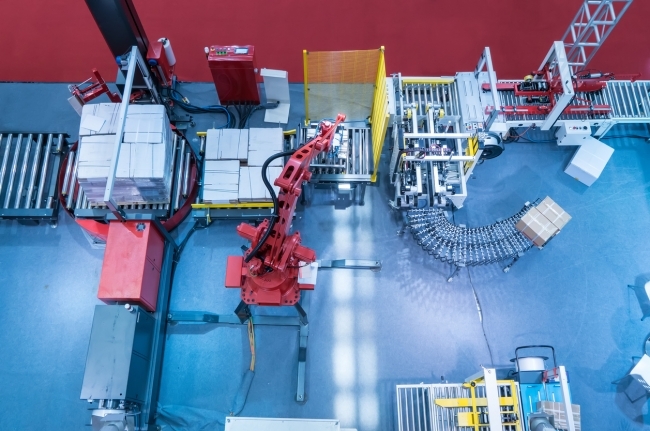 Robots and other automated technologies are integral in improving speed and efficiency, allowing manufacturing companies to optimise production workflows, inventory, work-in-progress and value chain decisions. The Amazon Effect has done far more than condition consumers to a new way of transacting. It’s ushering in new ways of working, dictating changes from the front-end to the back-end of your business. We’ve become used to immediacy and intuitiveness of transactions, and we now expect the same from processes and products, requiring faster innovation from manufacturers. To keep up with these new demands and expectations, manufacturers must embrace digital transformation – supported by ERP – to liberate and lubricate the flow of information and work product across the enterprise. This increases production and transparency while decreasing costs and downtime – with the ultimate goal of satisfying customer expectations.